Happy Memorial Day to you. It's started off horribly here. All 5 us us seem to have gotten a nasty head cold at the same time. Normally it comes in waves, but everyone started feeling rotten yesterday. My oldest is marching in a parade today, and we all have to go stand and watch later. He's trying every ounce of patience we have (and anybody that knows me knows I have none to begin with). Nothing like starting a gorgeous day off horribly when he refuses to walk 2 blocks with me to where he's supposed to be meeting the band. Completely refused. Made me drive him. The piping is stitched so that the color of the piping is different from the HST's and the ribbons of the outer border. It's completely colorful. Here are a few corner shots...As you can probably see, I hace done just a touch of painting on this quilt to bring out some of the quilting details. I need to hand stitch a sleeve, and send fabric off to a bloggy friend who is making me a label. There are a few crystals still to stick on, and a few rust spots to hopefully cover. I'm losing interest in the quilt quickly on account of all the problems it caused in the last month. I'm not entirely thrilled with how the Glide thread has tensioned in some places, but it is too late to fret too much about that. I'll probably just keep it for shows that are not exclusively for machine quilting. The creativity, piecing, and applique ought to gain me plenty of points. 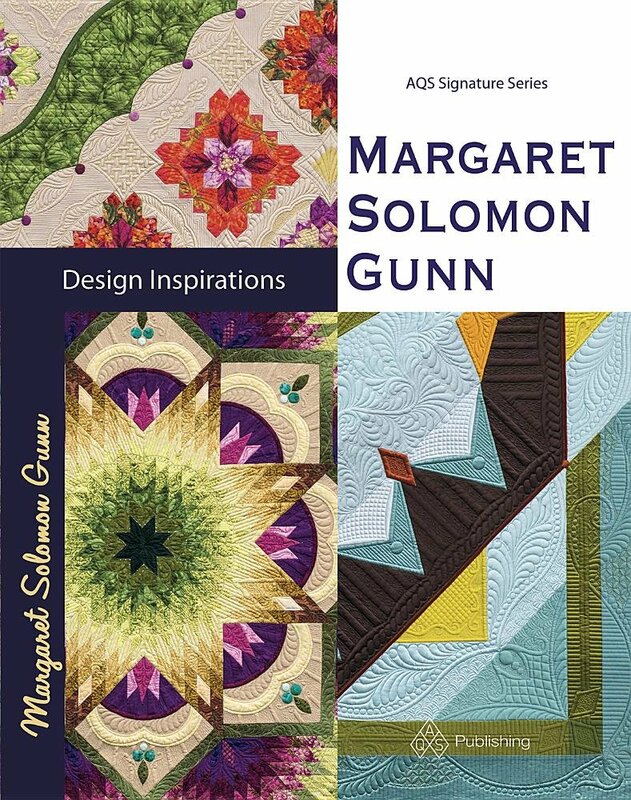 If you are in New England, the first show it will go to is my home state show - The Maine Quilt show in late July. Since I won best of show there last year, I really want to send a good quilt. Though I think this had the potential for doing well, I'm not loving it as of late. Now, I am just glad to have it nearly finished. I'm also planning to send it to the Lowell Quilt Festival - so if you are in this area, you can see it and give me your impressions. I have some clients that tend to bring their own battings. Generally this is just fine. I've never met a batting I just couldn't quilt with, although there have been some I prefer not to use. When the quilt is finished, as long as the quilt is not lumpy or uneven in thickness, what's the harm? That is how most people see it, but don't you just want batting in your quilt? Well, I want to show you a photo of packaged Warm & Natural 100% cotton batting. I get this batting from time to time. The batting often has little pieces of debris throughout it - little cotton plant sticks and branches. I try to pick these out, but seriously, that is just not my job, and I just hate to think that a supplier is selling this crap. The other thing I find offensive about this packaged batting is that it always has an odor - kind of like something burned in the process of making it. Maybe it disappears when the quilt is washed, but I really don't like it. The clients that use it generally say that they use it (1) because they think it is cheaper, and (2) that they purchase it at Joann's with a 40-50% off coupon. Now, the W&N that is either purchased on an entire bolt or cut from a bolt seems to be better. Before I had a business I bought their 40yd bolts, and never had problems. It is primarily the packaged battings that are inferior. I just want to show you that it's not worth the discount people think Joann's is offering. I just did a quilt that was 77"x100" - a large twin, but too large for the 72"x90" twin or even the full-sized packaged batting. I checked Joann's site and they charge $22.40 for a queen batt - and this is on their 50% off sale. I stock a nice Hobbs 80/20 batting (shown below without any sticks & twigs, or funny smells), that would have run the client only $17.33. I do buy wholesale, so that is why I can compete with local merchants on cost. I supply batting to clients as a service. I get no kickback from Hobbs to sell and use their batting. I just do it because I like it. This post is really to inform all of you that think buying the pre-packaged stuff when it is on sale is a good deal. It's not - because the stuff is not very good batting. Do you want your child or baby snuggling up with cotton plant debris? 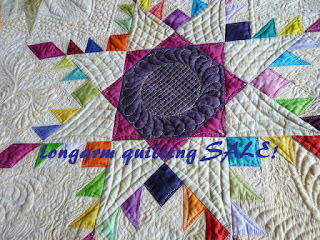 In honor of my recently passed birthday, and the start of summer (drum roll please)...I am offering a sale on longarm quilting services. If you are interested, please email me directly. I'll probably keep this sale active for 1-2 weeks, but so long as you contact me, you'll get the special price. All paper pantographs and freehanded edge-to-edge designs are discounted 15%. 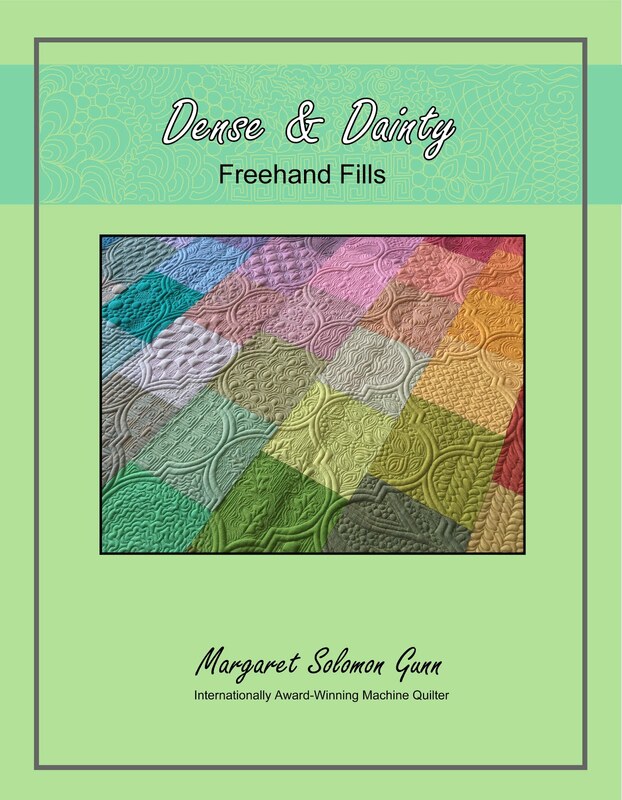 In addition, if you have tops that are either very busy print or pattern or may be a utility quilt, stippled quilts will be offered at 1 penny per square inch. This is a great deal! I do stock battings, and have many threads to select from. As always, I will also take your custom quilts too, but at the moment, the sale only pertains to all-over quilting designs. Some ideas of designs I have quilted are available at www.MainelyQuiltsofLove.com. Thanks for looking at my blog, and welcome to the Blogger's Quilt Festival. The quilt I am showing is called Sea Glass. It is 63"x78" and is my original design. It is currently at MQS in Kansas through this weekend. It's made from all batiks and hand-dyes. 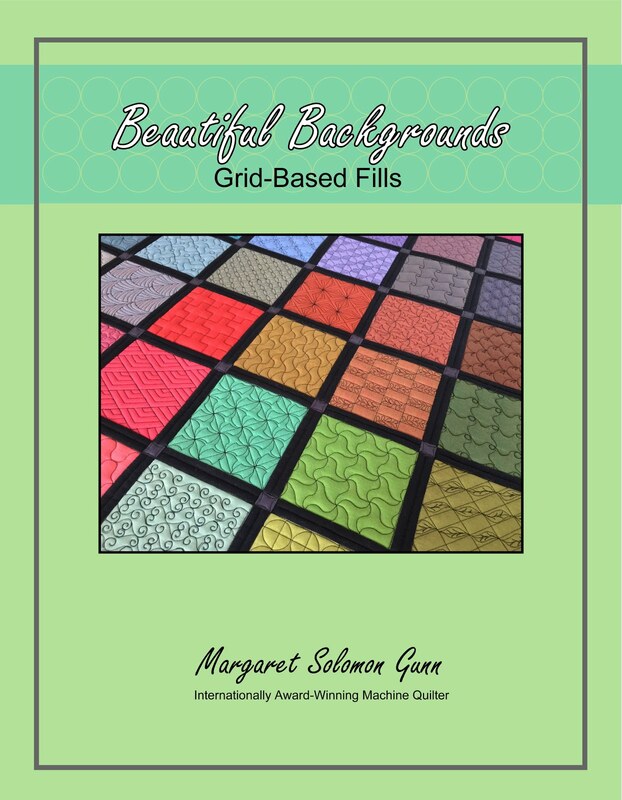 The watercolor background is made from the kaleidoscope block. I then hand appliqued waves, and machine appliqued the 120 or so small pieces of sea glass. I had this quilt already in progress prior to last summer. But last summer my kids and I discovered a couple of beaches that had lots of pieces of sea glass to find. It became our little obsession for the summer, wondering if the beach we were going to would have as much as the last. Anyway, I had many pieces of batik for a while, and just thought they just looked like sea glass. I knew making the quilt was my destiny. The quilting was liberating. It was my first quilt that I have longarm quilted that was mostly free-form quilting. My machine is not computerized, but I wanted the motifs in the quilting to appear free and organic, as they do in nature. The sea glass pieces are arranged in a symbolic wave, emanating from the wave, and being deposited on the beach. The only "structured" quilting was on the outer border. It is axisymmetrical - opposing corners are the same, and it has a scalloped edges. The feathers, though wavelike, are intended to juxtipose the unstructured and randomness of the churning wave of water. Here are some of the interesting organic fillers I used. The opposing borders (ones with scallops) have this design. The feathers again are somewhat wavelike, and the curved-crosshatching is just to give the design a change of structure. I should also note that this quilt is currently in the Quilting Gallery's quilt of the week contest. I'd love it if you'd hop on over here and vote for it!! 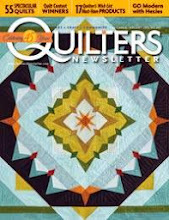 One of my quilts is in Quilting Gallery's weekly quilt contest. Go have a look here..
and then vote for Sea Glass before Sunday! update...purple and blue Konfetti are all that I have left. This is a fiercely cute baby quilt one of my clients made. She always does impeccable applique, all by hand. I had fun with the white background, since this is the only place the quilting really shows up. I originally thought about doing something more constructed in the white areas, like wreaths, but quickly realized how boring that would be. I think the straight line frames and different designs create a nice framework for the owl, and create way more interest. Perhaps if you double click, you can see the ferns, and leaves and large bubbles/pebbles (nickel sized). Here's a close-up of whoooty...He's so cute. I left him largely unquilted so that there is some loft (and I did not want the piecing from below that she didn't cut away to be so obvious. The border is bead-boarded with simple sweet scallops. It's fitting of a baby boy. This quilt actually has a poly batt, since it will be washed many times. Plus, I want the features to maintain their loft and texture. I used a Wonderfil Master Quilter thread. This is a relatively new thread for me; I got 15 cones a couple months ago. It's a 40wt thread, and stitched like a dream with Bottomline in the bobbin. Here's a peek at the back. Is that not fun?? I have held back writing a post the last few days. It's not that I haven't had things to say (or vent), but I have figured that my readers are mostly like myself. I like to go to blogs to see quilting inspiration, not a hot-headed and frustrated person blabbing about how horrible things are right now. Am I right? Well given that this is my so-called holiday, I figure I am due. In my defense, I have had week for the record books as far as quilting issues go. Without all the throws that kids give you, the stress of my quilting week would have driven many a girl nuts. To sum it up, my next show quilt which I foolishly have already submitted to 2 shows late this summer, had the dyes bleed during the blocking process. They bled and bled and freakin bled. And then there was the rust from the pins I used to cover all the fabrics with 96 color catchers. Like anything much else could go wrong. On the 3rd time I blocked the quilt, which in and of itself is an hour process that puts sores on the tips of my fingers, the next day when the quilt was mostly dry, I discovered a powdery residue from the laundry detergent. I sent the quilt through 2 wash and rinse cycles, and reblocked. The next morning, I STILL found freakin residue in a few places. I treated these with the quilt on the boards, repinned the section and agreed with the gods that I'd toss the quilt in the trash if I saw residue the next day. That was yesterday. Now, all the stain stick usage and washing with oxyclean has obviously faded the once bold colors of the batiks a little, but today, with no obvious residue, I can agree to live with the new colors the quilt has. Afterall, only I really know how bright and vibrant it was. It still has immaculate piecing, and an original design. The quilting is about as good as I am capable of. I spent about 350 hours on this quilt. I hated resolving that I would toss it if it didn't come clean. I think I can live with it at this point. I guess I have to. Am I right? This is Mother's Day. My 10th Mother's Day. I remember the first, holding a 2 month old baby, and thinking it doesn't get any better than this. I was right. Two more kids have come, and I wouldn't change that, ever. I don't really like kids, that's no secret, especially other people's kids. I'm not fond of a herd of kids all in my front yard. But there is something comforting about my own. Something happy and familiar. Even with the good days, kids challenge my sanity and need for order on a daily basis. It has been a hard and stressful 6 months. Many a day I have questioned why I wanted to be a mother. I have a 7yr old that has some behavioral challenges. He's very easy frustrated, and is the picture of defiant. We've taken him to any and all doctors and specialists that have agreed to see us in the last 6 months. To our pleasant surprise, he finally got a Rx for an ADHD medicine 2 days ago that makes him like a different child. In December we were told he doesn't fit the ADHD symptoms enough, but it looks like they were wrong. A child who doesn't misbehave at school is harder to get diagnosed properly. Hopefully, the rest of his days will go as well as the last 2. My other 2 kids are what have kept me grounded through everything. It is hard to pack it up and walk away when the other's are needing your love...when they are giving you love. It may seem at times as though the kids are tearing your relationship apart, but they are the glue that holds you all together too. It is that for which I am grateful. Mid-week, results from HMQS came out. I hesitate posting this because I know that there are many quilters that will roll their eyes and think I am just the type of person that is never happy. That is not it whatsoever. I sent 2 quilts - My Postcards from Venice quilt and Zen Garden. The latter quilt earned an Honorable Mention at MQX. I got a call on Wednesday from HMQS saying that I was getting an award. I was most excited. She would not tell me anything more. I found out the next day that it was another stinking Honorable Mention. I know that a ribbon is a ribbon, and I should be pleased and happy. Most quilts did not get that. And somewhere inside of me I am happy. But I am still disappointed. I am driven to do better, and deep inside I want to. I was in a funk over this, on top of the quilt bleeding issues. I really hoped for a better placement. Secretly, I really want and need some cash. I want to send my boys to a couple weeks of camp this summer. Secretly, I needed a better placement to give me confidence that what I am doing as a quilter is right. I'm mostly over it. The show is done, and the quilts will be coming home and then off to other shows soon. I have 2 other quilts at MQS this coming week to worry about anyways. The caliber of quilters at the shows is so good. How quilts place is so dependent on the particular show, who sends quilts, what category it is in, where in the country it is. Different locations have different apparent preferences for quilt style. There are many variables; I am starting to learn this. One quilt may win a ribbon at one show and then nothing at the next show. The reality may seem trivial, but it happens. Even quilters much better than myself have made these comments. It helps to give me confidence to accept what comes my way. If they have to, I do too. The fact remains that I have earned 3 honorable mentions this year and I am tired of it. I psychoanalyze why quilts don't do better (and why others do). I know that the last 2 shows I have entered are machine quilting shows, where more credit is given to the quilting than the piecing. I am learning to be a more interesting quilter, but seriously, I love intricate piecing, and it is where my preference lies. I am not as impressed by a quilt with a mediocre design and over the top quilting as I am one that has great piecing and adequate quilting. I need to find that happy medium with my quilts, as well as a more middle ground of the type of show I send my quilts to I guess. These are just things to ponder. 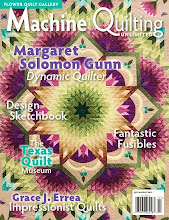 So when I think about quilts that would fair very well at machine quilting shows, I find myself in limbo. 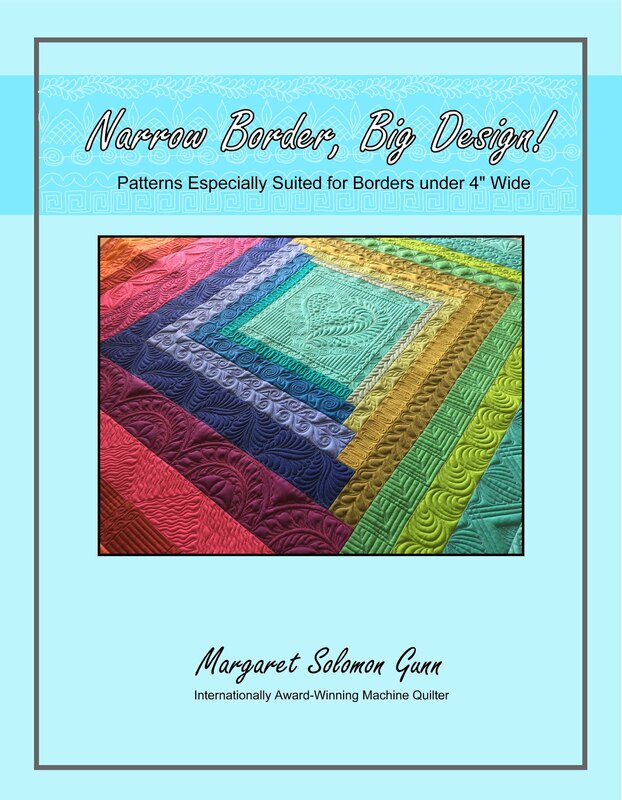 I'm not a huge fan of quilts that have vast openness dedicated to the quilting. Perhaps this is because I struggle to appropriately fill the space sometimes. Perhaps it is because I view it as unused space - space that awesome piecing or applique could enhance. I have a couple of quilts started, but for some reason, they are just not driving the ambitious side of me. I sat down and realized what I really need and want to do is make another quilt with detailed piecing. The last one (Postcards from Venice) had thousands of tiny mosaic pieces. It was challenging from a design standpoint. It utilized fabric colors I usually stay away from, and I swore I'd never use these fabrics again because they were hard to see to quilt. But something is driving me to design an other mosaic floor. Something larger than the fact that I have a bunch of Stonehenge scraps. There is nothing to regret about following your own heart and instincts. 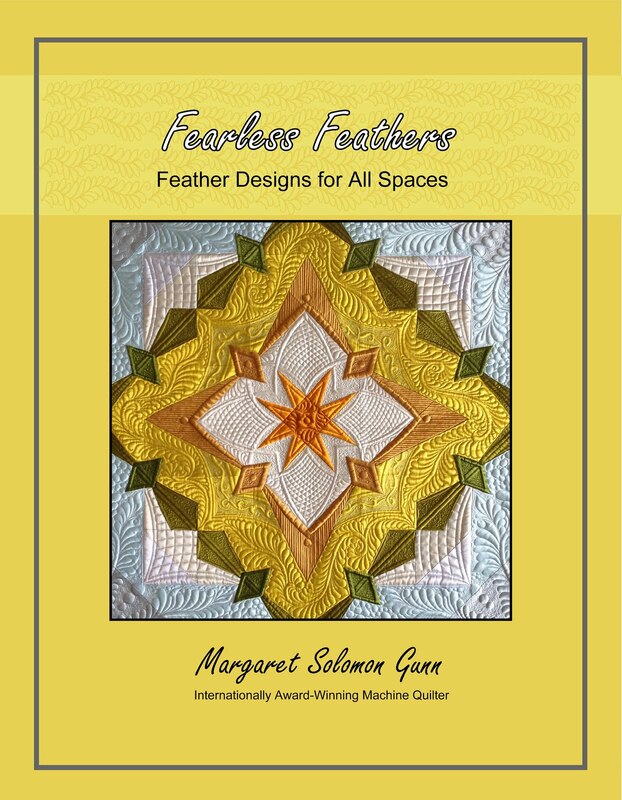 I know that intricately pieced quilts are harder to quilt to be competitive in machine quilting shows. It just gives me a bigger goal to work for. So it is my time now to go do that token bike ride my kids are begging for (then the hubby is going to take them away for a bit and give me "Mom time". I leave you with a link to read and ponder. As a mother, I frequently wonder what lasting harm I will cause my kids. Am I good enough? Am I inspiring them to follow their dreams? Or to try to their utmost potential? Will they do kind and lasting things for others? You know the questions. Any mother wonders these things. Parenting is seriously the hardest and least rewarding job any of us will ever do, in the moment anyways. Looking back, I hope I can look past these self-doubts and feel like I did as good a job on them as I do on my quilts. Will they be stained and rusty, or will they have learned from their mistakes and be proud little people? Go have a great day. When a Quilt Bleeds, What Do You Do? I have already done the first few things that pop into my mind of what to do when your quilt has bled...scream, hunt for chocolate. There was none. I went for a glass of wine. It took the edge off, but I needed to address this problem quickly. Afterall, paperwork for this quilt has already been sent in to a couple of shows. Three days ago, I cleared space in my basement to block my 80" quilt, which is just a hair too big to block upstairs in my bedroom (the usual place). It requires moving my bed too close to the door, making the room uncomfortable. Truth be told, my husband came to bed late one night when I had a previous quilt on the blocking boards. Maybe he forgot I had moved the bed, who knows. But he claims to have near walked straight into the bed upon entering the room. Either way, even with an 18' long room, it is oddly cramped with an 80" quilt on the floor. So...All set up downstairs. As soon as my daughter got on the bus Monday, I happily scooted off to wet my quilt and get it blocking. Here it is (above) all wet. Dontcha just love the texture that shows? !...That was the last moment I was really happy this week. Unless, if you consider the fact that I got the quilt all pinned on the blocking board, and did in fact discover it is a full 80" long (I had measured more like 78-79") - Being 80" makes it qualify for the bed quilt category, which is what I have wanted all along. Anyways, I am digressing. On Monday evening I checked on the quilt. It was very wet still and I was seeing something I really hate to see - staining of color on the light background. Normally I'd worry about the reds and deep plums, but the staining was all coming from aqua/teal materials. The Hoffman 1895 hand-dyes I use so often are fantastic and do not bleed, but every now and then I toss another batik into the quilt, as I have done here. Damn. Damn. Damn. See...closeup of the mess. It ran through to the backing in some places too. Yuck. I immediately sent off an email to the first person that I thought of - Vicki Welsh, Queen of Hand-dyes. I knew she'd have some good advice. I had a quilt last year (the one with all the tiny appliqued grapes) bleed, but it was small enough to wash in the washer with a bunch of color catchers hand stitched over the grapes. It came out fine. This quilt is big, and I did a cardinal sin - I trimmed the edge and had cut through the stitching, I feared that the stitches would unravel in a wash cycle, even though I did put a row of tight stitching around the perimeter. The washing machine is just not a possibility before it is bound. Stupid dots. Stupid teal bleeding fabric. UGH. And I can't believe that is blue and green on the backside! OK, so Vicki's advice is to soak it in a tub, submerged for 12+ hours with 1/2 to 1C of dish detergent (She uses Synthrapol, but thought the detergent would work the same). Start with water that is as hot as possible. She says 140F, but I measured mine to be 126F (I am an engineer. Ya didn't think I'd pass on measuring the temp did you?!). I added 3 large pots full of boiling water, which is no easy feat since the jacuzzi where the quilt is bathing is upstairs. The quilt is weighted down too to keep it submerged. For good measure, I also tossed in the last 6 Shout color catchers I had. I should say also that I have checked 3 stores locally and cannot find Synthrapol. Panic was beginning to set in. I came back 10 hours later to see how things looked. The 6 color catchers show tinges of aqua, but the staining is not gone. Some places are better, but it is showing in other new places too. I ought to add, it is hard when the light fabrics are wet to identify staining versus seeing the brighter colored seam allowance underneath the cream fabric. But I know my feathered star was not constructed with "bruise" colored material. Yesterday evening we picked up another package of color catchers (these were odd, with a detergent in a pouch) and another stain stick. I have already gone through 1 stain stick. I liberally coated the spots again and filled up the tub to soak it again overnight, throwing in all 10 of the oxy-clean color catchers. If one is good, ten must be better. This morning, after 22 hours of soaking, it is not normal yet. I am getting mad. And nowhere near here has Synthrapol. Sophie and I ventured out to get more supplies. I'm not messing around this time. What fool only uses 6 color catchers? These are the 24 pack of color catchers that I had used last year with success. I pretreated every stain location on the front and back with the Shout stuff. Probably used over half a bottle. I then attached all 96 color catchers to the colored areas of the quilt or anywhere that had evidence of bleeding. It appears to be complete and utter overkill times 10, but I am just sick of dealing with this. I started hand stitching them on, but wet quilt is hard to stitch through. I used pins for most of them. Will have to be super careful handling the quilt tomorrow. Blood would be harder to remove. I then folded this monster up, loaded the tub for a 3rd time with hot soapy water, and proceeded to hope for the best. Oh, and for good measure, I did pick up a $3 bottle of ReTayne at Joann's for future quilts. They didn't have the Synthrapol though. The blue hue in the tub is the laundry detergent. Funny, because I have shelled out $37 for 5 boxes of color catchers and 3 stain sticks! I have checked it half a dozen times since I stuck it (with it's 96 color catchers) back into the tub. I even ran the jacuzzi pump a couple times to generate a little turbulence and bubbles. Not sure why. Maybe the white noise of the pump is soothing. Maybe I have really lost my mind. Now, I guess I will just go about my day and check it at bedtime. As they say, the watch pop never boils. Whatever happens, I gotta think that whatever dye is coming out of the quilt, it will have released all it is released in 44 hours. So for better or worse, tomorrow it goes to the blocking boards. Cross your fingers for a positive outcome and stay tuned. If ANYBODY else has any other advice, should the staining not be gone, please speak up. I'd love to hear from you. And I know, prewash. Prewash, and prewash again. Can't you tell I'm not a prewasher??? I will be. I did this quilt last week for a client. She made it for a young woman, as a tribute to her grandmother. It has photos and embroidery on the quilt, which she did not want stitched on. These blocks were (I think) about 5" square. In my opinion, they are a little large to not be stitched, even a little bit with a clear thread, but maybe the quilt won't get heavy use which would wear the batting in these areas. The client wanted a light custom. It turned out to be a complete pain because there are 30 blocks and I had so much stop and start because of the sashings. In hindsight, I should have probably incorporated the sashings into the block design. Live-n-learn. The sashings are a high visibility area on the quilt because of their bold color. I quilted the top in a taupe Glide thread, which on account of it's sheen, stitches out looking like a metallic gold. This looks great most places, as there is gold imprinting on at least 2 of the fabrics. On the sashings, of course, this is the location of highest contrast - fabric to thread color. It's not my favorite look, but ok. I'd rather the thread to disappear on the sashings...just one of my design twitches. Her embroidery blocks were SO gorgeously stitched. I can only dream of stitching that nicely. She's mixed small amounts of what looks to be jelly roller pens to fill in areas on the embroidery too. It's a very cool effect. Oh, and the beads and crystals are a great touch too. The borders are pretty all done. The back of the quilt is just a muslin (I think). It's a good quality, thicker muslin, but still it's like wearing your underwear to a party. OK, only your underwear (didn't want to insinuate that you all don't wear any the rest of the time!). It shows all bloops and blunders. This is why I didn't really want to quilt in anything but a tan or ivory thread. This is a crazy busy week with appointments 3 mornings and kid's things 4 afternoons after school. It is also the week of HMQS in Salt Lake City. I have 2 quilts out there, so keep your fingers crossed. I have 5 weeks and 3 days until life comes to a screeching halt (kids are out of school). I am frantically working on as many things as possible. My quilt is going on the blocking boards tomorrow afternoon. It appears to not be quite as square as I hoped, and has shrunk to under 80" square (80" is the magic dimension to be able to enter it in a bed quilt category. Drat! One of my goals with that quilt was to have it bed-sized. Off by an inch! Oh well...the piping and binding are all prepared - just needs a dry, blocked quilt. Should be all set in 4-5 days! This is the quilt of a new client. She's done a fabulous job piecing these stars. It was the flattest and most square quilt I think I have ever seen...more so than my own work! And considering that I am an obsessive-compulsive quilter, that is really saying something. It is batiks, and was made to give to a man. Yikes, if that doesn't put a screeching halt to the creative quilting juices, I don't know what does. No swirly, girly, pretty feathers or flowers. She wanted an E2E, and fortunately, she and I were in instant agreement on the design to use. I pulled the Razorgrass panto. I have used it once before. It's not appropriate for many quilts, but it seemed just right here. The tan batik fabric has a pattern to it, which may not be visible, but it mimics the Razorgrass pattern. This pattern is a real thread Hog. It is 76" square, and I think I used a mile of Superior's Omni thread! This was the first time that I had minor issues tensioning with the batik backing which was sent. Normally batiks run just fine, but I had a harder time maintaining the tension at the spikey points. My suspicion is that once it is washed, it will be a mute point, but the perfectionist in me just wants it to look perfect. Tomorrow's Friday. I have some designs to go contemplate. My newest show quilt went onto the frame for the day for a few final tweaks. It should be ready to block come Monday. Yea!!! Have yourself a fantastic and quilty weekend.